According to The Kimchee Cookbook, this pungency is “necessary for stimulating the flow of saliva and the appetite.” It seems so much easier to just buy kimchi, but there are a couple first world problems with this. 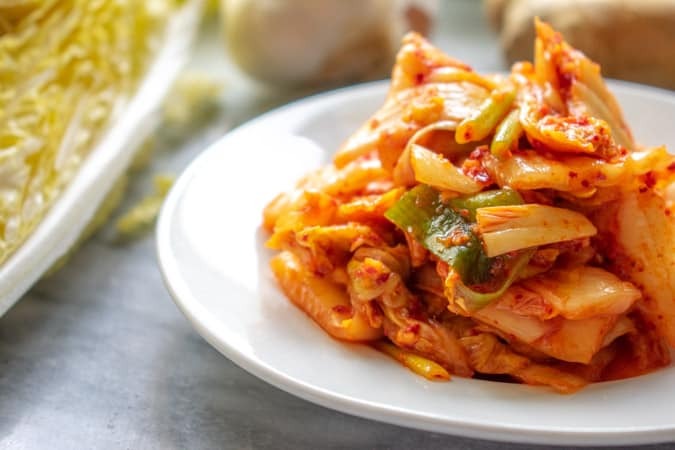 This very easy kimchi recipe allows you to try making it at home. Napa cabbage – Relatively easy to find. Appears usually in the winter at farmer’s markets. The summer heat wilts the delicate leaves, so not too many farmers grow it then. Korean chili powder – This comes in coarse and powder form. Coarse is preferred for better flavor. This must be frozen if you do not use it within a month or two, or else the color will oxidize and turn brown. Coarse Sea Salt – The Korean version of sea salt is light, fluffy, and not too salty. According to The Kimchee Cookbook, magnesium chloride in sea salt is essential to keeping the cabbage crisp and chewy. Table salt is not recommended for that reason. If you don’t have sea salt, kosher salt will do. Onion & Green Onion – Even easier to find, (yay!) The addition of onion adds a nice flavor to the kimchi. 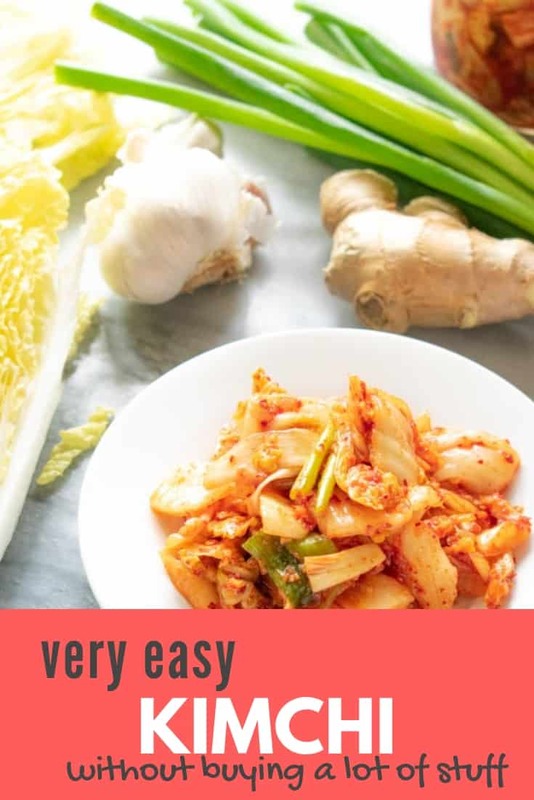 You could add other vegetables such as grated daikon and carrot, but this recipe is keeping kimchi making as basic as possible. Fish sauce – A fish/sea component is classically added to kimchi as they are a peninsula country. Even more traditional would be the baby salted pink shrimp, but again, keeping this recipe basic. Don’t most people have fish sauce in their pantry? To add or not add Sugar? Some recipes will add sugar to round out the flavor and perhaps give the healthful bacteria something to feed on, but the use is debatable. Some restaurants add quite a bit of sugar to their kimchi, such as that it tastes noticeably sweet. I’ve noticed that kimchis made without sugar taste very much like homestyle and emphasize pungent notes to go alongside the main dishes of the meal. I use this Thai fish sauce that contains fructose and hydrolysed vegetable protein in addition to anchovies and salt. Thai fish sauces tend to include sugar, and I find that little does help the flavor of the kimchi. Some Korean brands and the famed Red Boat fish sauce does not contain any sugar. In that case, you may want to add a teaspoon or two to taste. After salting, the cabbage will reduce in volume by 1/3 to 1/2 of the original size. Flavor the cabbage with the sea (especially if you use the coarse sea salt). Start the preservation process. Salt induces amino and and lactic acid fermentation. There are two ways to brine the kimchi, with or without water. If you just toss the salt over the cut kimchi, you really need to massage in the salt, so it will fully penetrate into each piece. This also takes alonger and is best done overnight. Therefore, this recipe uses a saltwater brine to salt the cabbage just a tad more evenly, without so much mixing. After chopping the cabbage into 2″ pieces, toss them in a solution of 1/3 c coarse sea salt mixed with 4 cups water. You need to let the cabbage sit anywhere from 2-4 hours, turning occasionally, to make sure the brine distributes evenly. This is the most time consuming and irksome part. 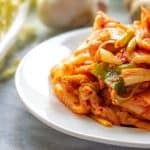 There are quick kimchi recipes designed to eat the kimchi right away, but this is not one of them. Once the cabbage has reduced in volume and the salt has penetrated the leaves for flavor, you will need to wash the cabbage under cool running water to rid it of excess salt. It may seem counterintuitive, but additional salt will be added via fish sauce. If the cabbage is not rinsed, you run the risk of being too salty. 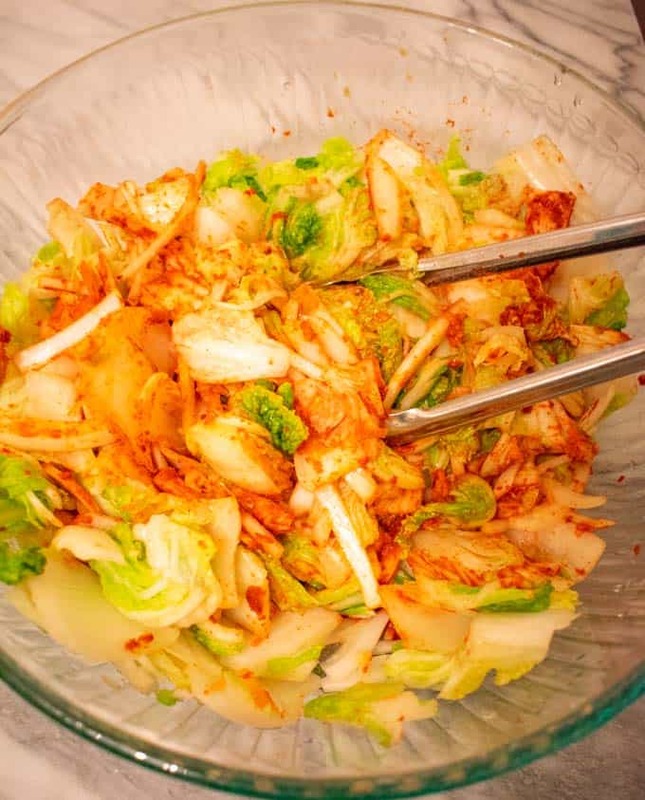 Kimchi is generally made with coarse ground Korean chili flakes. However, this picture features Korean chili powder, just to make sure no one would die. This would be fish sauce, ginger, garlic, onion, green onion, and Korean chili powder. The chili not only acts as a coloring agent but as a preservative in conjunction with the salt. Add the drained, salted cabbage and mix well. This is often done with hands and a plastic glove to really massage the seasoning into the cabbage leaves. However, tongs will suffice, if you don’t care to handle your food so much. Give the kimchi a taste. It should be a little salty but not too salty. Some of the saltiness will dissipate to sourness as it ferments. Adjust the seasoning with more fish sauce or sugar to taste. 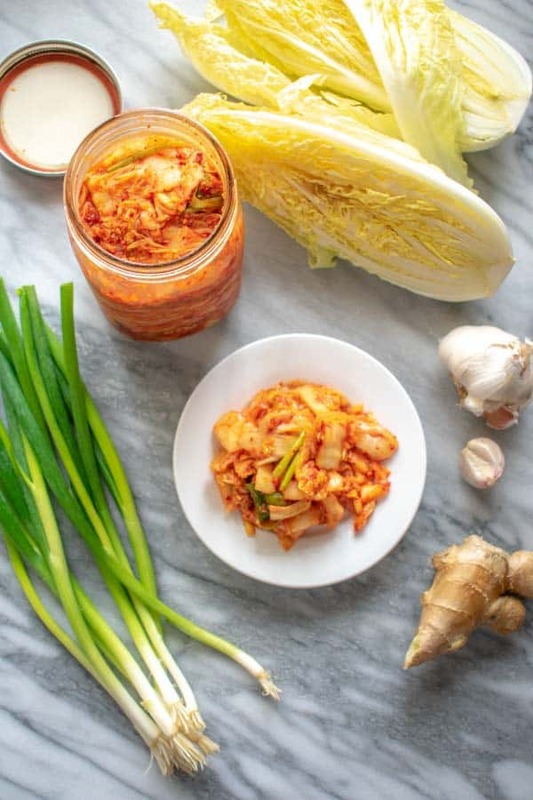 Once the kimchi is all mixed up, it can be packaged into jars. Leave it out at room temperature overnight to speed up the fermentation process. Pack in the kimchi into the jar. You want to avoid contact with the air and submerge it in its own juice. It will continue to draw out liquid as it ferments. It can be refrigerated and stored for 1-2 months. It will continue to get more and more sour. 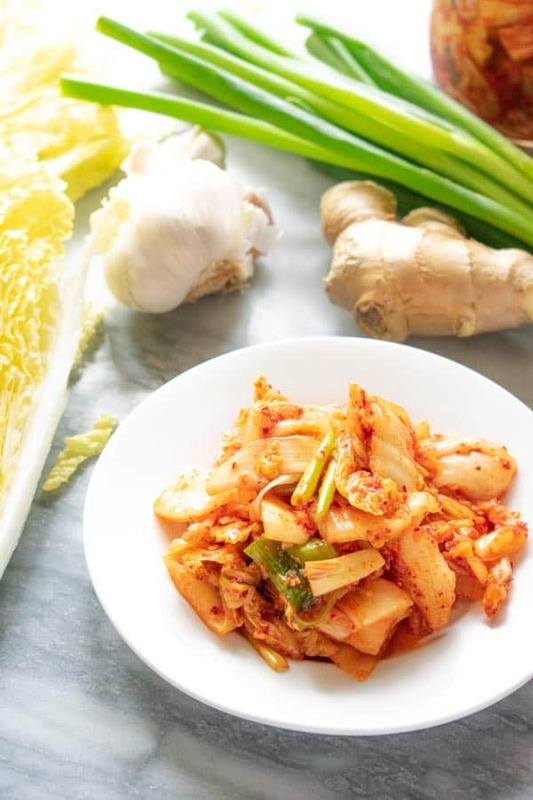 To eat the kimchi right away, if you really can’t wait, you can toss it with some rice vinegar to mimic the sour flavor of fully fermented kimchi. A touch of sesame oil and/or sesame seeds would be nice too. How long do you keep kimchi? Depending on how cold your fridge is, the kimchi will ferment on its own time. Generally, after a week it will begin to have the fermented sour flavor. After a month or two, it will overferment and get very sour. As in too sour to eat by itself. Then you can cook it in soups, stews, stir-fries, or fried rice. It’s the gift that keeps on giving. As with all similar practices such as winemaking and bread baking, fermentation is an art. It requires a little checking in and adjusting a living breathing thing to get those microbes on your side. 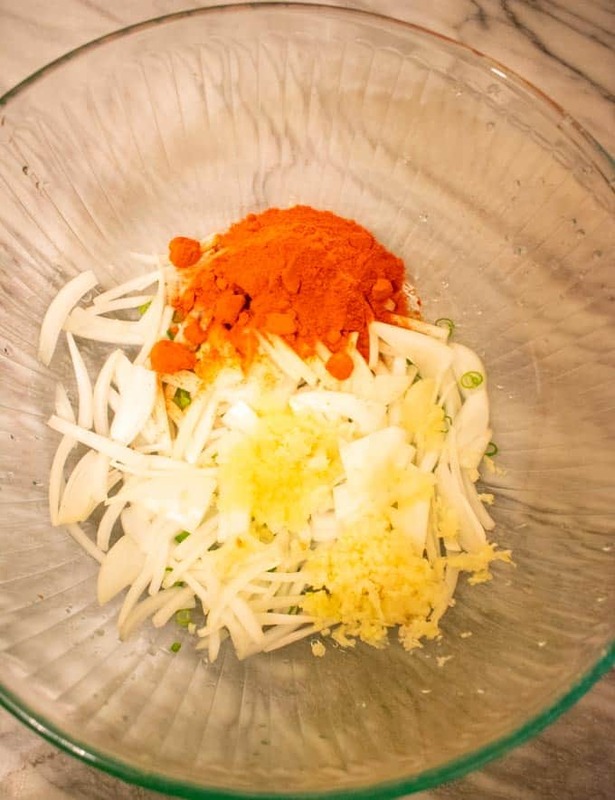 Try one batch of kimchi and adjust the salt and seasonings to match your own taste. 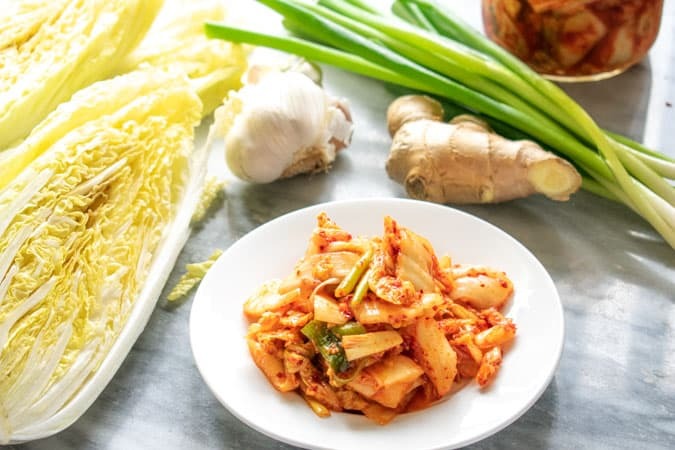 The fifth taste is not “umami” but pungency according to Korean cuisine, and it's on full display in this very easy kimchi recipe. Make it from scratch without buying a lot of ingredients. Mix together the saltwater brine until salt is dissolved. Thoroughly mix napa cabbage with the salt water brine. Let sit for at 2-4 hours until the cabbage has reduced in volume by at least 1/3. 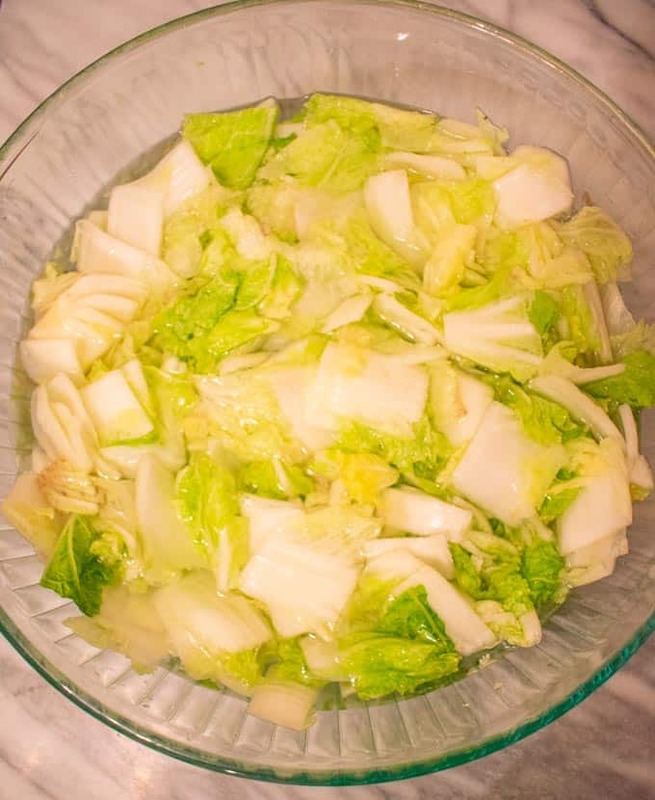 Drain and rinse napa cabbage under running water to rid of excess salt. Thoroughly mix drained, salted cabbage with the remaining ingredients. Taste and adjust with fish sauce, sugar, and chili flakes if needed for more flavor. Package into jars, cover, and let sit at room temperature overnight. Refrigerate and eat up to 1-2 months. 3 lb of Napa cabbage yields about 9-10 cups once chopped. 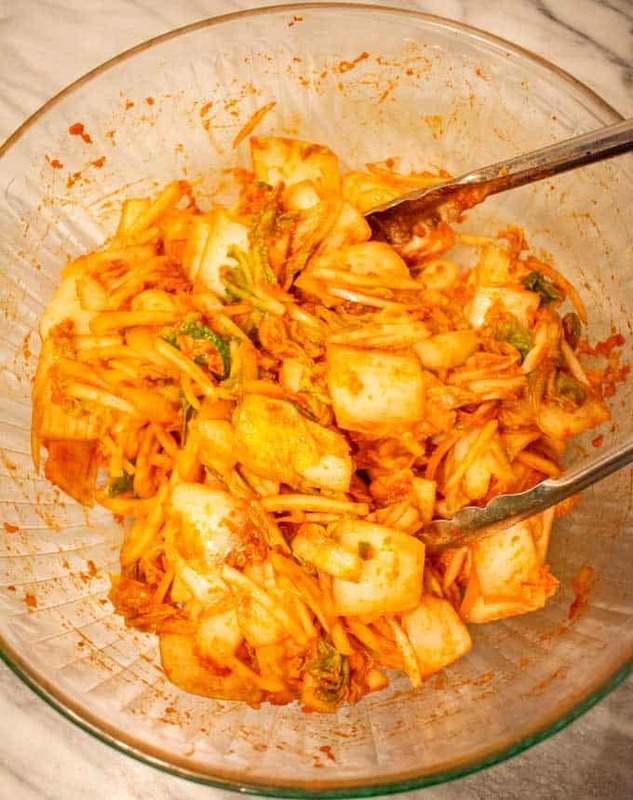 After seasoning and salting, this recipe yields about 5 cups of kimchi. The onion and green onion are optional. If you prefer not to use them, reduce the fish sauce to 3 Tb. I use them because they are common ingredients that might be sitting in your kitchen.